An Infinity screen ... showcased at bauma. CDE Global’s latest successes have been in Kuwait, where three quarry operators and a sand washing facility are deriving benefits from its efficient systems. Three quarry operators and a sand washing factory have recently upgraded their operations in Kuwait with equipment from CDE Global, a global leader in materials washing. The latest of CDE’s orders have come from Al Matrook Trading and Contracting, which owns a sand washing factory in the Jahra Desert area and has just ordered its first fully integrated mobile sand washing unit. The unit replaces its outdated sand screw installation which was losing fines and generated multiple issues such as blocked pipelines, resulting in increased downtime and maintenance needs as well as loss of production. Al Matrook’s new CDE M2500 will soon be deployed on site to feed, screen, wash and stockpile on a compact, portable chassis, with a specified hydro-cyclone to efficiently and accurately remove silts from the sand product. The new plant will dramatically increase the client’s production of washed sand from natural and crushed sand and gravel, optimising the process by twinning the M2500 with an AquaCycle, which recycles 90 per cent of used water. The revolutionary bolted Infinity screen, integrated to the M2500, will guarantee precise screening by the strongest and lightest, fully galvanised screen ever created by CDE. Al Shammeri found the sales process professional and seamless, and is especially appreciative of the technical expertise the dedicated CDE project manager and engineers brought to the development and deployment of his new installation. “CDE did a thorough inspection of my current plant capabilities and understood my requirements well, following which they suggested the best value-for-money solution as well as the most efficient process for my requirements, which impressed me the most,” he says. Garg and Al Shammeri (right). “CDE invests a lot in its team to bring the latest technology up to the market to serve the planet,” Al Shammeri adds. Al Shammeri says the current plant will take care of all the sand washing requirements of Al Matrook, and as all CDE plants are modular, he knows he has the option to increase production in the future should the company’s business needs evolve. 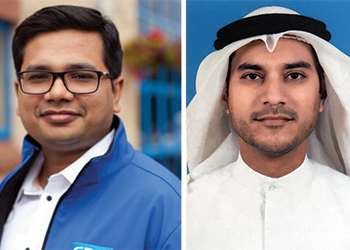 The reputation of CDE as a global leader in materials washing is spreading fast in the Gulf region. Already patent-pending CDE Infinity screens are being snapped up by clients over the world. A finalist at the Innovation Award at bauma construction equipment show, CDE, through thoughtful and innovative engineering driven by Finite Element Analysis, has developed the unique Trilogy side wall technology, which optimises strength-to-weight ratio by utilising material in the side wall where it is needed. As a welcome bonus, the Rosta suspension units deliver 98 per cent vibration isolation, ensuring protection for the supporting structure and the most efficient transfer of energy to the screening material. The Infinity screens’ bolted construction eliminates the need for welds which are prone to failure due to the high stress concentrations they create in conventional screen constructions. The U-Span cross members, in combination with the construction of the side walls, deliver higher specific stiffness that prolongs the working life of the screen. 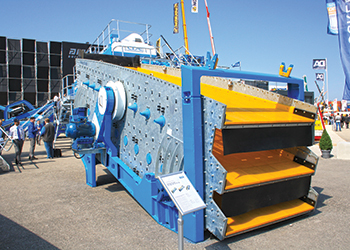 Variations in the range of 13 new screens allow clients to refine their choice and opt for a VibroSync drive, an integral structural part of the screen which helps to reduce weight even further and utilise power for the purposes of dewatering, or a VibroCentric drive, which optimises the mass in the rotating shaft by placing it where it can create the largest effect on screen performance. “The main advantage of the Infinity screens is the combination of strength and lightness, which significantly reduces energy consumption,” explains Ruchin Garg, CDE business development manager for the Middle East and North Africa (Mena) region. With a fully galvanised structure, which is an essential feature for optimal operating conditions in the Gulf region, the screens’ patented side walls also eliminate the need for welds and, therefore, prolong the life of the equipment, he adds. The Infinity range has been tested on a variety of applications, with excellent results in the treatment of sand and gravel, crushed rock, iron ore, construction and demolition waste, silica sands and more, according to Garg. “The Infinity screens are incorporated into the CDE materials washing range but are also perfectly adapted to the market of replacement screens as they function autonomously, which makes them a very attractive proposition to clients wishing to invest in a replacement screen in new or existing installations. So we can now say that the future in the Middle East’s quarrying sector is bright and weld-free,” he concludes.